On the 22nd of October last year, the Abbott government announced a National Commission of Audit  to ‘to review and report on the performance, functions and roles of the Commonwealth government’. Headed by the chairman of the Business Council of Australia, Tony Shepherd, the Commission has a remit  (PDF) to examine the scope, efficiency and effectiveness of government spending. A key task for the Commission is to recommend ‘savings sufficient to deliver a surplus of 1 per cent of GDP prior to 2023-24’. With Defence accounting for 6.5% of government outlays, it will have to attract the attention of the Commission. There’s certainly a precedent; the Howard government’s 1996 Commission of Audit  recommended a 10% efficiency improvement target for government agencies and specifically said that Defence should be included. It wasn’t. Instead, the government imposed an ‘administrative savings program’ amounting to only 1.3% of the budget. This time around, the situation is made more interesting by the Government’s promise to boost defence spending to 2% of GDP within 10 years . The cost of maintaining a modern defence force increases by between 2% and 3% above the rate of consumer inflation. Consequently, the scale and/or sophistication of the ADF will decline in the absence of long-term growth in defence funding. Boosting Australia’s defence spending to 2% of GDP within a decade will demand steady real increases of about 5% each year. Based on Defence’s struggle to absorb 3% real growth in the 2000s, such a high rate of growth may prove infeasible. Settling a target of 2% of GDP for defence spending makes the cardinal error of privileging inputs (money) over outputs (capability). It’s almost certain that a reasoned analysis would yield either a higher or lower figure—there’s nothing magic about 2%. Moreover, with funding fixed at a significantly higher level than the recent past, the risk is that the White Paper will degenerate into a taxpayer-funded shopping expedition for the military. In the past, the unreliability of defence funding has led to substantial waste and contributed to periodic Defence budget crises. The government needs to make a realistic long-term commitment to defence funding and stick to it as far as possible. To guard against the emergence of yet another underfunded plan for the ADF, the government should commission an independent audit of the affordability of the 2015 White Paper to run concurrent with its development. Return the top-structure of Defence to something like it was in the late 1990s and continue the process down through the hierarchy. Recent reforms instil confidence that Defence’s internal business processes can be made to work efficiently. Further refinement of Defence’s shared services model should be pursued in tandem with outsourcing where it’s cost-effective. Deeper levels of private support to ADF operations should be explored. There’s nothing intrinsically meritorious about high numbers of military personnel, nor are civilian personnel inherently wicked or wasteful. The Defence workforce should be built around having people with the right skills and experience to do the job at hand at least cost. Although there’s scope for further improvements to the conception and execution of major defence acquisition programs, the surest way to retire risk and deliver capability quickly is to buy proven equipment off-the-shelf. Performance based contracting for materiel sustainment has the potential to boost efficiency. And, while doing so with legacy platforms is difficult, the support arrangements for new platforms should be established in tandem with their acquisition. The benefits sought in establishing DMO as a prescribed agency haven’t been achieved. Nonetheless, privatising DMO would be a mistake. Instead, it should be administratively reabsorbed into Defence. With massive naval shipbuilding programs now taking form, critical decisions that will determine the long-term efficiency of the sector are looming. Given how deeply Defence is entangled in the issues, an independent external review of the naval construction sector is essential if the taxpayer’s interests are to be protected. The business case for further estate rationalisation should be examined, even though near-term costs will likely outweigh long-term savings in the current fiscal environment. 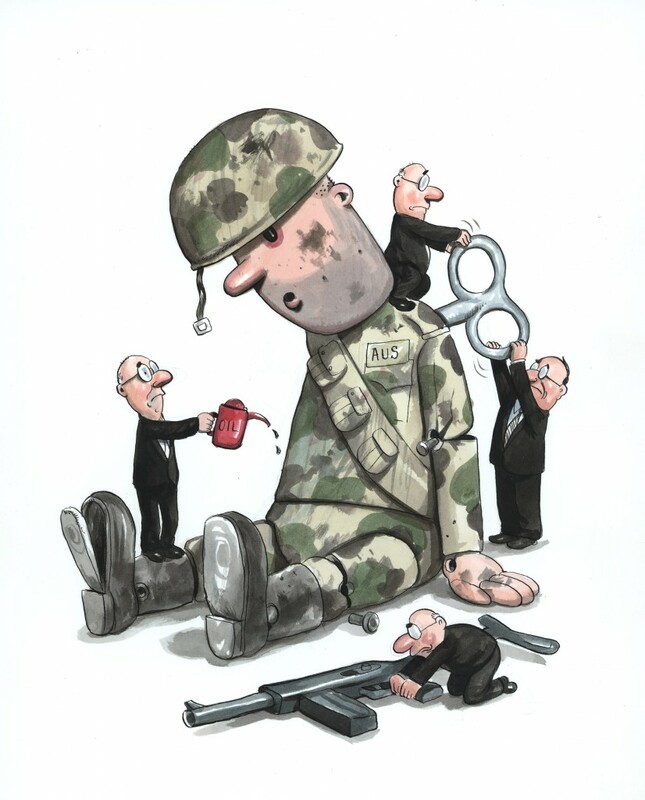 There can be no greater inefficiency in Defence than having the wrong force structure. The 2015 White Paper should ensure that plans for the ADF represent a coherent and effective strategy for protecting Australia’s interests in the 21st century. There are of course many more things that could and perhaps should have been said. But the Commission’s scope embraces the full gamut of government expenditure—our goal was to alert them to the most important facts about defence spending and the best opportunities for further efficiency. Sometime in the next few weeks we’ll be able to see what the Commission thinks when they release their interim report in time to shape the forthcoming federal budget.